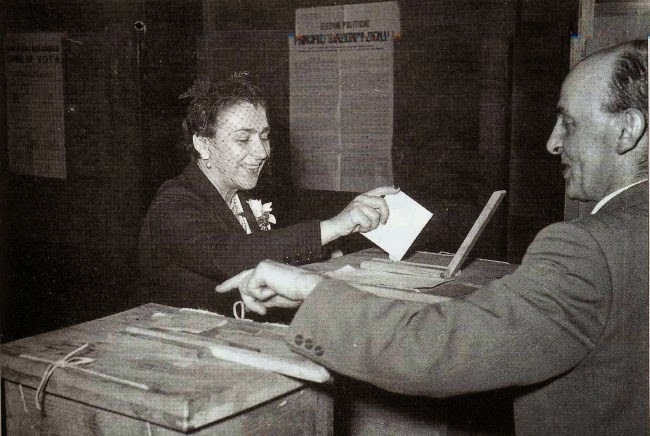 Italian woman at polls for the first time in history, in 1946. Today was the day when the Italian women, for the first time, seen recognized their right to vote at the political election. We were in 1945 and they were called to the election only one year later but it finally ended a long path. It all begins in the nineteenth century when a group of sporadic but strong and combative women, including, perhaps, the most famous Anna Maria Mozzoni, tried to bring attention on the political issue of the Italian women, who were neo pseudo citizens, with the support of a few political figures as Mazzini, at least in the ideal, but especially thanks to Salvatore Morelli, the first parliamentary who for the first time has submited to the Italian Parliament, of the newly formed Italian nation, in 1867 a law for women's political vote, however without being able to obtain results. But just as other laws in favor of the vote for women by Salvatore Morelli and by other parliamentaries such as Mr Lanza in 1871, Mr Nicotera in 1876-77 and again by Mr Depretis in 1882 didn't obtain results. Even Anna Maria Mozzoni tried to revive the political discussion addressing directly to Parliament with a petition in 1877 that actually had the merit of opening a serious parliamentary debate, but in the fact, once again, did not bring the hoped reform, desired, sought even after other petitions and conferences over the years that Mozzoni organized to reclaim political rights for women. In 1879 she founded a league to promote political vote for women. 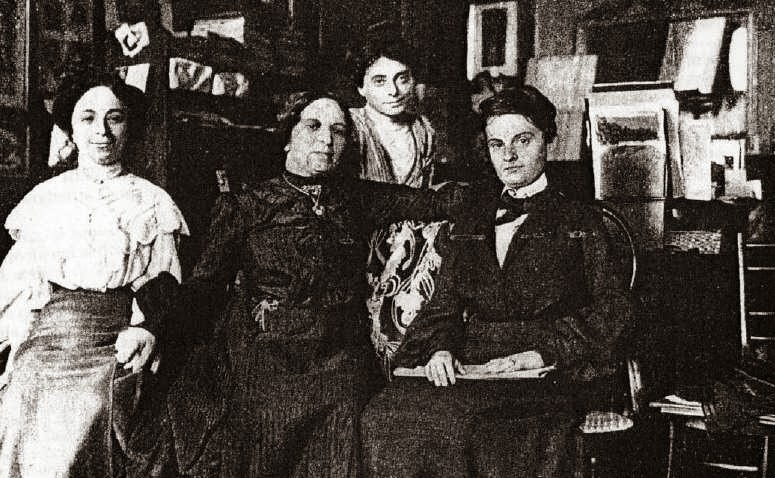 However Italian women, at the begining were more intrested in social arguments such as education, in spite of this first approach, for the revange of political rights of women few associations were born: the "Associazione nazionale per la donna" (the National Association for women) in 1897, the "Unione femminile nazionale" (the National Women's Union) in 1899 and the “Consiglio nazionale delle donne italiane CNDI” (the National Council of Italian Women) in 1903 as the "Comitato Nazionale pro-suffraggio" (the Italian National pro- Women's Suffrage Committee). at the "National Women's Union" in 1899, in Milan. The early years of the twentieth century, however, brought the first fruits, even if sour and bitter. It had to record the failure, once again, of a new bill in favor of universal suffrage, proposed by Congressman Mirabelli, and, over the years, by Turati, by Treves and by Sonnino, as well as new instances from Mozzoni and in general by the committees created to complain about political rights for women's vote. The Italian National pro-Women's Suffrage Committee, e.g., worked to foster a healthy debate in a country that seemed more open to the possibility of taking into account the possibility that women were a political entity, so in its Congress her president, Giacinta Martini Marescotti, brought to the attention of the public and the Italian politicians, that other countries have had important advantages since they had recognized this right to women. However, no efforts led to a result until after the first major conflict, in fact, after the first world war, many political factions rallied and declared themselves in favor of the female vote, including the Partito Popolare of Don Luigi Sturzo, that even proved to be contrary to the position of the then Pope Pius X clearly unfavorable to the female vote ("God preserve us from political feminism") but this position adhered also to the neo Fascist Party, favorable to women’s vote too. Moreover, thanks mainly to the fact that during the war women had been the real strength of the country and replacing men at work who were employed at the front, they had, according to the visions of men of that time, a credit from their country because they have proven to be and worked as men, so this led to the Law of September 1919 which finally approved the right to vote in local and political elections to women, but if this law passed in a very short time at the chamber of Deputies, it never found the way to get to the other House of Parliament, which had previously been dissolved, and declined as other laws pending approval. In the meanwhile Fascism took place, and even if in its early days it had touted the granting of political rights to women, now instead revised and simplified the promise promulgating and ensuring only administrative vote with constraints and contingencies, but we know that in a short time it will revoke political rights away also to all those who enjoyed them. The second post-war once again sees women fight, during the war in the Resistenza for the freedom of their country, and after, for their rights thanks to the emergence of Groups for the Defense of Women (Gruppi di Difesa della Donna), created by the Communist Party, which were recognized by the Government of National Liberation, CLN and subsequently reorganized in UDI, Union of Italian Women with the aim of representing and advancing, in a unified way, claim policy in favor of women. However, the Italian Women Centre (Centro Italiano Femminile CIF ), also born from Catholic women who did not identify themselves in UDI. Both organizations, however, cooperated together to resolve the political issue of Italian Women and from their collaboration and tenacity, born the document "Italian women have the right to vote" (“Le donne italiane hanno diritto al voto”) presented to the Government of National Liberation, CNL. The urgent care that women were able to maintain high and active finally led to the law of February 1st, in 1945, which recognized, to Italian Women the right to vote for the first time. Sono eleggibili all'Assemblea Costituente i cittadini e cittadine italiani che, al giorno delle elezioni, abbiano compiuto il 25° anno di età, eccettuati i casi previsti dagli articoli 5, 6, 8, 9, 10, 11 del presente decreto. Finally Italian Women conquered the full enjoyment of their rights: administrative, active and passive political vote ... even if they haven't yet the freedom of wear lipstick on election time, as it was suggested to them by newspapers at the moment of election for not to stain voting papers. And if today we couldn't be worried any more about wear the gloss during the election time, it opens a very different account, a current and contemporary reflection on effective political representation of women which is far from closing and which leads today to a whole other story whose protagonists are just us. SALVINI ELISABETTA, “Ada e le altre. Donne cattoliche tra fascismo e democrazia”, Ed. Franco Angeli, 2013, pag. 16.